Action man takes on zombies! Join forces with the coolest guy on the block, to take down the apocalypse virus dead zombie people! Run, jump and gun your way to safety, through an endless fun filled train station full of zombies! 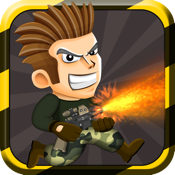 * Fast paced, run and gun gameplay! * Zombies galore, coins, pickups and obstacles!